Fairtrade. Nuts about fair trade. 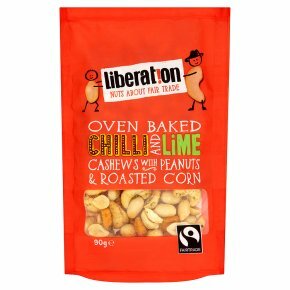 Suitable for vegetarians & vegans.This spicy, tingly, crunchy snack is made with nuts grown by the smallholder farmers who own a 44% share of Liberation Foods. They focus on growing the tastiest nuts for their own company. How's that for being about Fair Trade? We have to warn you: Young children may choke on nuts.